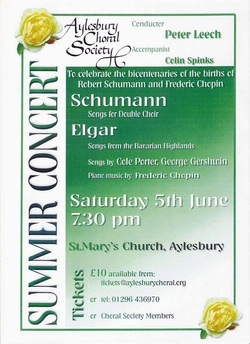 Aylesbury Choral Society performed their Summer Concert on Saturday June 5 at St Mary’s Church. Traditionally this seasonal treat is an informal affair, with lighter music and a smaller than usual choir in mufti and this was no exception. It was not all sweetness and light however as two of the featured composers, Chopin, and in particular Schumann, both born 200 years ago, led short and tragic lives which were often reflected in their music. The Chopin contribution was a Mazurka played with great delicacy by pianist Colin Spinks, who also provided excellent accompaniment throughout. Schumann was represented by a delightful piano piece, again played by Spinks, and three of his Four Songs for Double Choir in which the Choral Society captured the very different moods. We also heard excerpts from Schumann’s Dichterliebe, a sequence of love songs composed in 1840, the year in which he finally married Clara after a long and secret courtship, eloquently sung by conductor Peter Leech. Gershwin’s S’Wonderful, Cole Porter’s Let’s Do It and Begin the Beguine and Arlen’s Over the Rainbow were sung by the choir in arrangements that provided an excellent showcase for the choir and were much enjoyed by the audience.